Robotic process automation (RPA) is quickly gaining traction with our Finance and Risk banking clients because of the substantial benefits that can be captured in a short timeframe. Our work with banks in this area indicates that the magnitude of benefits gained depends on the incremental improvement in existing highly manual processes and pain points. Like many core back-office organizations, Finance and Risk departments generally have several hot spots where automation can deliver rapid payback. 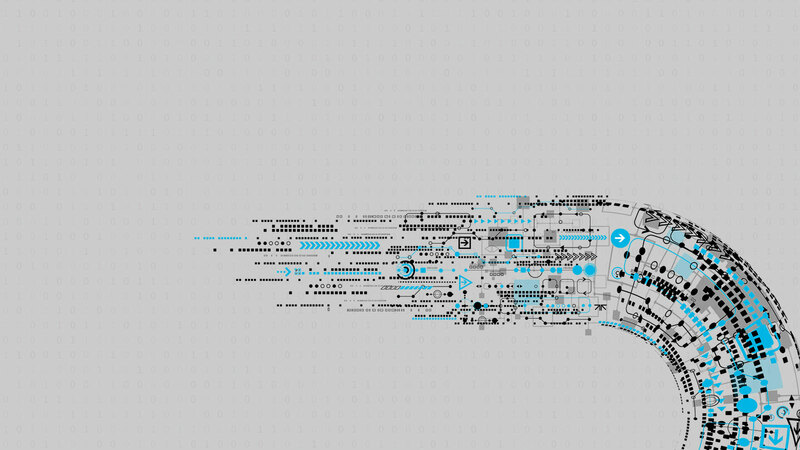 View the full presentation on Innovations in Finance and Risk – Robotic Process Automation. We find that our banking clients typically benefit from cost savings within the 20-60 percent range, and a few banks generate cost savings as high as 80 percent. Additionally, these costs savings could be realized in very short timeframes—for a simple RPA project, we have seen payback in as little as three months. Even for an RPA project with high complexity—with implementation across several data sources and applications—we have seen breakeven achieved in less than 12 months. But automation is not just about cost savings efforts—the impact is much broader for our banking clients. Other gains include capacity as well as reliability and service level improvements. One of our clients has found a heavily manual process to be over 90 percent faster with RPA. More typical gains in speed and volume of tasks processed have been in the range of two to five times faster. Because of the increase in speed, RPA facilitates an effective increase in the capacity of the Finance and Risk organizations to process more volume of activity in the same period of time. We saw a productivity gain of 60 percent at one of our banking clients in invoice processing alone. Since the chosen processes are repetitive and don’t require analysis or decision making, we have found that the service levels can actually increase to 100 percent accuracy, such as in the consolidated Record-to-Report process for example, and 100 percent of the time. This is a difficult operational goal to attain; even with the most extensive training, humans can make simple errors. While errors may be caught downstream, resolving the issue will just add time to complete the task. We are finding that RPA is a very effective tool to manage operational risks—and could positively impact associated capital requirements. Delivering an operational goal of 100 percent of the time would be cost prohibitive to implement in our view using only human workers. These examples focus on measuring the benefits of robotic process automation relative to existing processes for banks with their existing systems. Given the efficiencies RPA can deliver, our clients have started re-examining their operating models and IT investments with a fresh perspective. RPA is clearly a solution for current processes but beyond that, it can drive a level of efficiency that can potentially redefine future processes and operating models. Offshoring of Finance operations, for example, have many processes that would benefit from RPA and could be done cost-effectively. While RPA could be done offshore, the feasibility of returning some operations in-house becomes suddenly within economic reach. 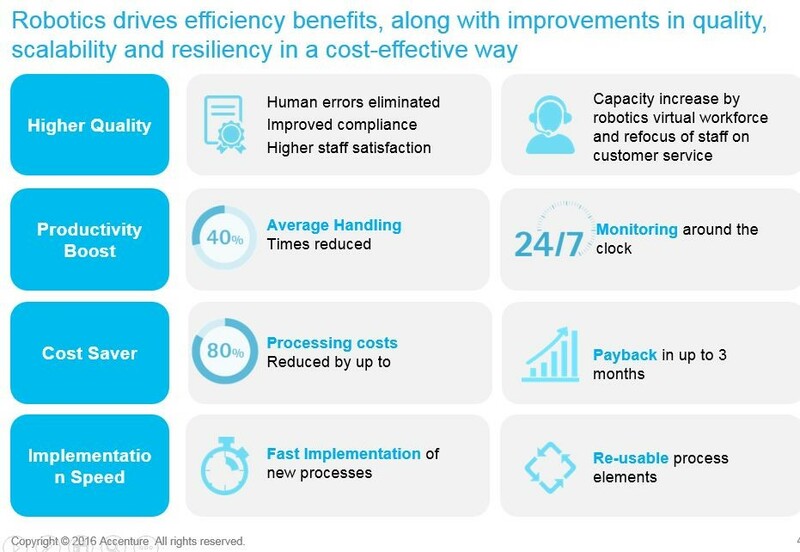 How does robotic process automation deliver comprehensive value? RPA is more than just a macro running simple jobs on a desktop. It is a rules-based engine configured to replicate existing business processes across various systems using multiple data sources and applying complex content or time-based rules. Therefore, RPA could change the way banks view and manage their IT investment portfolio. What began as perhaps a tactical workaround solution, running in conjunction with existing systems, could evolve into a more perennial investment by changing the duration that IT ROI is measured. But not all processes are ripe for RPA. Read the other posts in this series to learn how we help our clients evaluate and prioritize the processes they want to automate. Are UK SMEs’ cyber security fears standing in the way of digital innovation?